Updated broadcast and cable ranking for the past week and the week before. Live programming occupied the top eight spots in the week’s program ranking: basketball and hockey playoffs, the final two episodes of The Voice, Nik Wallenda walking a tight rope near the Grand Canyon, and an America’s Got Talent episode. True Blood was the top scripted program (in 10th place). 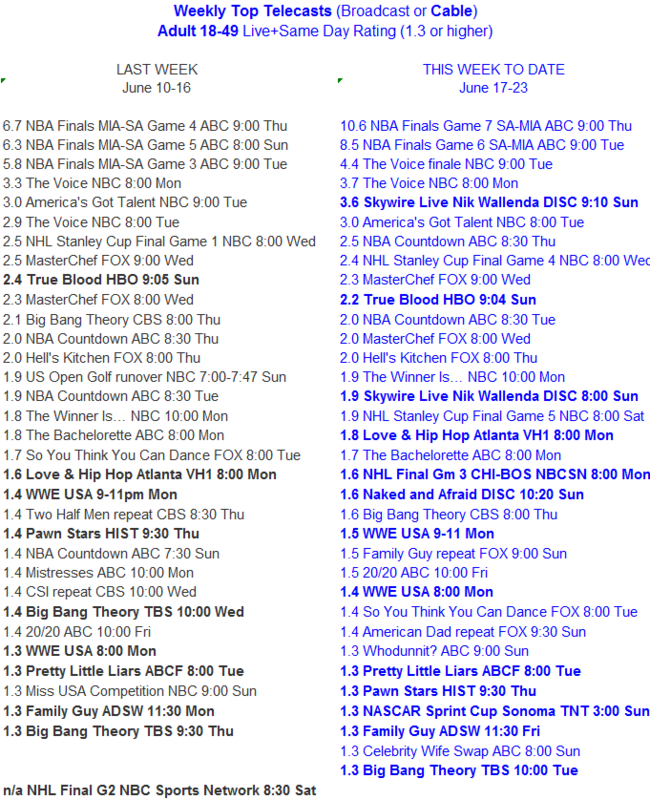 For reference, the season finale of Mad Men on AMC did not make our list (maxing out at a 0.9 rating). Updated broadcast and cable rankings for this week and last. A very quiet week on broadcast and cable, as usual for the week featuring Independence Day.